The Rinckel Mansion was built by butcher Mathias Rinckel from 1875 to 1876. The elaborate and sophisticated Italianate home was designed by San Francisco architect Charles H. Jones, a graduate of the Ecole de Beaux Arts in Paris, who used French craftsmen to complete the interior of the solid brick residence. Rinckel had attained his initial wealth from mining, but later became a successful merchant selling meat products to Virginia City miners and Glenbrook lumbermen. He purchased the most modern of labor-saving devices for his home from the 1876 Centennial Exposition in Philadelphia. The foundation is six feet high and of dressed sandstone ashlar. A six-sided porch envelops the east side of the home. Doors are handmade, and panels, window casings and transoms are morticed and pegged, requiring few nails. Most furnishings that adorned this building were imported from Europe, shipped around Cape Horn. The front foyer and stairhall, master bedroom, two parlors, the dining room, a kitchen wing and hall are on the first floor. Four bedrooms, each with a large bay window, and a trunkroom are found on the second floor. The main stairway is cantilevered, so no outside supports are used. Bathtubs were installed in this house before the White House. An earlier version of this mansion, the King--McBride House (1870), is located in Virginia City. Rinckel passed away in 1879, but his widow and children continued to occupy the mansion until her death in 1933. Their daughter, Louise Rinckel, married George Blakeslee of Tonopah, and they resided in the house until 1960. After 1941, when the mansion was featured in a Paramount Pictures film, The Remarkable Andrew, the Blakeslees operated their home as a private museum. After Louise's death, Ronald Machado ran the museum until 1968. Today it is one of the best remaining examples of high-style Victorian architecture in the American west. 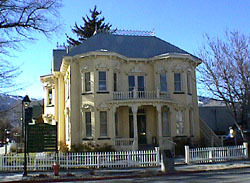 The Rinckel Mansion is located at 102 N. Curry St. in Carson City. It is privately owned and currently occupied by the Nevada Press Association. It is not open to the public.